How much can a survey tell you? By Lucy Rhodes,Project Apprentice Made in Hackney. 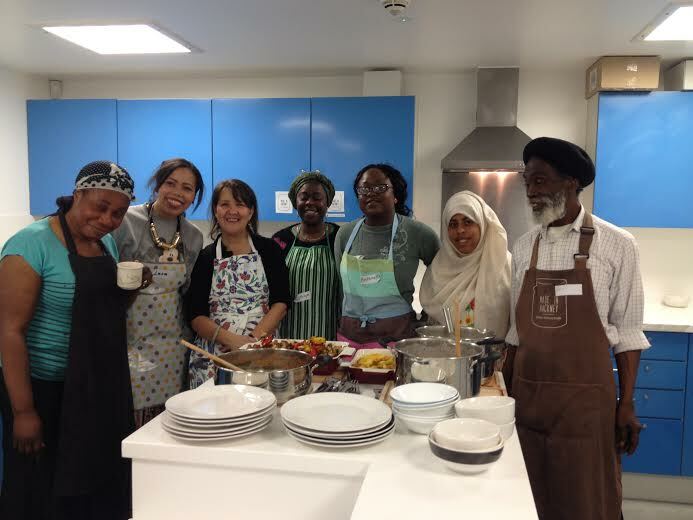 I have just finished hosting a 6 week cookery course delivered by Made in Hackney at the Redmond Community Centre. The course was titled ‘International Cuisine’ and it certainly lived up to the name! We learned to cook dishes from Turkey, India, the Caribbean, West Africa and Thailand. Each week the brilliant teacher came armed with a whole trolley full of fresh seasonal vegetables, herbs, spices and wholegrain alternatives to the usual white grains with which we would make a feast! As we went along, the teacher explained the flavours of the particular region and the herbs and spices we associate with each cuisine: sumac for a flavour of the Middle East, the sweet-salty-sour balance of a Thai curry, hot peppers, and thyme for a Caribbean jerk seasoning. All great ways to get a feel for a way of cooking without being a slave to a recipe. And then we cooked… Mainly in teams of two or three, each making a dish. Inevitably, people would wander between the stations and give each dish a stir, a taste, asking one another what they had added so far. I loved the fact that it was a real team effort; everyone chatted amongst themselves, shared advice, and got to know their neighbours. It became more than just a cookery class; it really was a community coming together. Barriers are broken when you are at the kitchen counter chopping vegetables, stirring a pan or rolling pitta bread, you share something and that is a lovely thing to witness. The participants were mainly women, as is usually the case with cookery classes. Come on men, get involved! As for age range I think ‘wide’ is the best way to describe it, the same for nationality, but neither meant anything in the kitchen, everyone just got involved and got on. It is not easy to make friends in the busy city we live in but I can honestly say that friendships were made here. As I cycled home at the end of the final class, I passed a few of the participants, up a dangerous looking ladder, picking cherries from one of the trees together! The beginning and the end of the course, however, involved a lot of box ticking by the participants so the funder could assess whether we had done our job of providing healthy cooking classes and changing attitudes towards unhealthy fast food.But how much do those ticked boxes really tell them? Do they convey the sense of community we witnessed, the coming together of a group of people who have probably passed each other in the estate streets countless times but never said hello, the making of friends, the sharing of recipes from so many different cultures, the laughter, the heartfelt thanks and hugs we were given after the final meal was eaten? Yes we taught cookery skills, we helped steer people towards healthier food choices, we did all we were asked to do by our funders but I was left wondering why they are satisfied with a stack of ink on paper when they could have come and joined us, seen what we did, saw the human story behind the ticks and crosses on their feedback forms. It seems that so many funding applications are just that. Applications on paper. If funding is granted then results are measured on yet more paper. I think it would mean so much more to the people given the funding, and to those giving it out, to come and witness what we do. See the smiles on faces when they eat a meal prepared from scratch and share that with people in the community who they would never usually interact with. That is why we do this. Not just to tick the ‘yes definitely’ box, but to see the smiles and witness that wonderful sense of community.